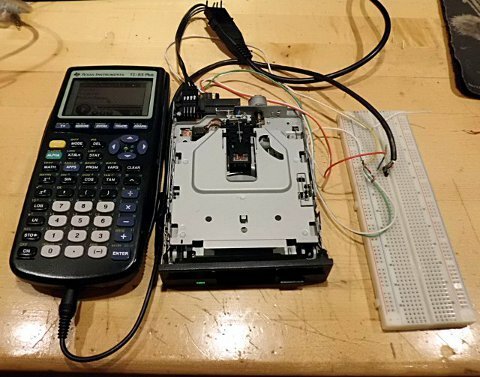 One month ago, my floppy drive music with a calculator project accrued widespread internet attention, with the video reaching 45,000 views and over 100 likes in a month, and the project featured on Hack a Day, Engadget, and many other sites. Since then, the plans have been frequently requested, though unlike other projects of mine, I unfortunately did not have the hardware plans and software packaged for release when I announced the project itself. I have finally found time after final exams and other factors in my life to write up a brief explanation and draw the schematic for the project, as well as package and publish the necessary software. You can explore the construction plans and download the software at the links below, and if you haven't already seen the video, click through and enjoy! What if we have a TI-84+ SE and we only have the USB cords? Then you won't be able to build this project without getting a serial link cable or at least a 2.5mm stereo plug and some wire. Do you think I can build this with a TI-89 Titanium? I've got the serial 2.5 mm jack cable. Yes, easily, but you'd have to write the software for it. Are you comfortable with 68k ASM or C? Alternatively, if you can find a decent monophonic music player for the 68k calculators, I can probably guide you through modifying it for this particular purpose; I can always pick Lionel's brain if I forget something. btw: I've read some documentation for TI-89 C programming and I found that it was really hard. I haven't found tutorials or stuff like that. Are there some tutorials for ASM or C for TI? Regarding C on the 89, if the tutorials on using it for that give you problems, perhaps trying to learn on PC first, following the tutorials on cprogramming.com? Once you know the language well, you can work better in more limited environments like the 89, and by extension, the Casio Prizm. Saying that floppy drives are monophonic is like saying that conventional loudspeakers are monophonic, or that PWM is monophonic: All of these things can be true, but that doesn’t mean that they must be. Getting multiple, simultaneous frequencies out of the stepper on a floppy drive is a straight-forward thing. The results won’t be pretty, and there will be nothing practical about it, but just because it’s useless doesn’t mean it can’t (or shouldn’t) be done. Or get multiple floppy drives (and multiple calcs, if necessary) and make an orchestra! Getting timing synchronized could be hard, though. I considered ways to do that, including having an external circuit controlling the direction pin, allowing one calculator to pulse the step pin on two floppy drives, but I didn't try implementing it. Alex, I tried some tricks mixing frequencies on a single floppy drive, and the results were ear-shatteringly unfortunate. Welcome to Cemetech, by the way; feel free to Introduce Yourself when you get a chance. Everyone: I will be demonstrating this system, among several of my other calculator hacks, at Maker Faire 2012 in NYC in two days. © Copyright 2000-2019 Cemetech & Christopher Mitchell :: Page Execution Time: 0.204385 seconds.